Just as anyone who lived through Edward Heath's three-day week can be identified by their tendency to stash candles in kitchen drawers ("in case the lights go out"), so anyone who grew up in the Cold War can be identified by their tendency to worry about blast and radiation protection at odd moments. Your reviewer was recently enchanted to rediscover his copy of HMSO booklet Protect and Survive (ISBN 0 11 340728 9) and to relive the joys of spot-the-balls (P&S recommends that you construct a 'lean-to' shelter from your household doors, but also that you keep doors shut to prevent fire spreading). This inspired a rereading of Peter Laurie's legendary Beneath the City Streets, with its discussions of enviable government boltholes. Ah, yes: those were indeed the days. It was, then, with a curiously cheery air that I settled down (pot of tea within reach) to spend yet more time with those grim playmates of my childhood: Mr Bomb and Miss Fall-Out. 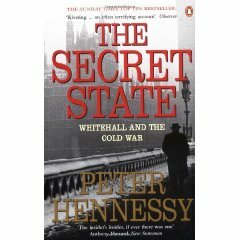 The formidable Professor Hennessy has that rare ability, being able to spirit lively narrative from dry official documents, and he has become a professional demystifier – the Adam Hart-Davies, in no demeaning sense, of British bureaucracy (there is, come to think of it, a physical resemblance, too). In The Secret State, he turns his attention to the threat of nuclear war..